The Oroville Inn is a five-story building (including interior mezzanine) with two attached one-story retail shop wings, all located on a large corner lot in the downtown business district of Oroville, California. Its exterior design follows the late 19th and early 20th century Spanish Colonial Revival style popular in California during that period. 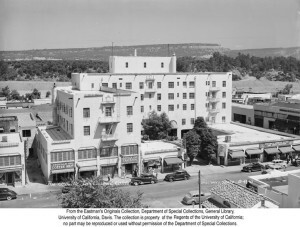 The hotel was dedicated on June 1, 1930. Because of its impressive dimensions and modern conveniences, the Oroville Inn immediately became the entertainment and social center of the area. Still in use and recently restored with meticulous attention to detail, the Inn survives today as the tallest hotel in California north of Sacramento. There have been no alterations, additions, or other changes that have affected the historic integrity of the property. Although the Great Depression descended across the nation just as the Inn was completed, Oroville continued to be a prosperous and busy place because the gold dredging industry here was at its height, and construction of the new Feather River Highway from Oroville to Reno was just getting underway and was not abated. Wealthy investors in the hotel like entrepreneur Walter Higgins and Wendell P. Hammon, developer of the first successful bucket-elevator gold dredger in the world, made sure the quality of service was never allowed to diminish. Considered the finest hotel along the highway between Marysville and Reno, with private bath in every room, the Inn was patronized by most visitors to the region, including famous movie stars, politicians, engineers, and even military personalities. After many idle years, the historic Oroville Inn is finally abuzz with activity again as workers begin exterior restoration work. Construction finally got underway early in June on a project to restore the 1930 structure. “It’s kind of dramatic,” said owner Bud Tracy in a phone interview Friday. “I kind of like it. It’s really getting exciting.” Tracy officially bought the 85-year-old former hotel from the city late last October, paying $400,000 that the city turned back toward the exterior rehabilitation. Eventually the interior rooms will be a dormitory for students of the Northwest Lineman College. Tracy also hopes to restore some commercial space and reopen the old ballroom for special events. Though Tracy expected to begin work immediately after the City Council approved the purchase last fall, it has taken awhile. The last two weeks have been busy. Roofs were removed from single-story buildings in the courtyard and asbestos has been abated, he said. Additionally, a small building that had been added on, partially blocking the arched entry to the grand ballroom, is gone. 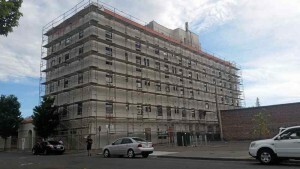 Crews have also started removing windows and air-conditioning jackets in windows . The penthouse at the top of the inn was stripped of lead paint. Tracy said there are two levels of paint work to do: taking lead paint off areas and then stripping all the rest of the paint. Removal of the lead-based paint is almost done, and stripping the rest will start soon, he said. Some work has been done inside, too. The kitchen has been gutted and the ceiling removed. Antique walk-in coolers that Tracy had hoped would be usable had to be removed because of severe dry rot. “They were not salvageable,” he said. The once-shiny hardwood floor in the ballroom has also been removed, and the building will have to have a whole new roof. Areas inside that were potentially damaged by leaks over the years have been torn apart to find the source of the leaks, Tracy said. The main focus inside at this time is on “discovery,” checking on plumbing and electrical wiring. A meeting will be held Monday to go over the results of the inspection and then a final plan will be drawn up. “The permit we have now is specific outside work and damage removal,” Tracy added. The renovation timeline has been somewhat delayed. Currently, the job is targeted to have the Lineman College take occupancy by spring 2016, but it could take until next summer. “We had some slips, and the roof had to be first,” Tracy said. “Really, the only thing we don’t know is what we don’t know.” Right now, he’s more concerned about financing staying the same as it is now. Article by; Barbara Arrigoni at 896-7767.